The World Series is upon us once again and we are a country divided: Cubs or Indians? Are we combing through Yelp for the best deep dish pizza restaurants with the most TVs or are we cooking up enough pierogies to feed the block? Are we hoping the Indians ride the winning coattails of Cleveland Cavaliers of last spring or do we want this guy’s 1993 yearbook inscription to prove prophetic? Which team do you buy some peanuts and Cracker Jacks for? 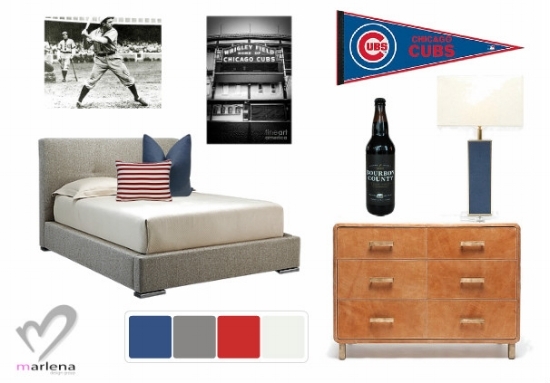 If the Cubs are your game, the team who hasn’t been to the World Series in over 70 years, perhaps you’ll toss a royal blue blanket onto your bed and do some painting in your team colors. If you’re thinking about the days of smelling the sweet leather of your baseball glove, why not spring for a leather dresser instead? It hasn’t been as long for the Indians as it has been for the Cubs (though still a hot minute) but if it’s Cleveland who will take you out to the ball game, maybe deck your bed with some denim accent pillows. A delicious cream colored throw blanket with a deep navy stripe is as fresh as a game day baseball. If the smooth wood of your little league baseball bat makes you wax nostalgic, add a wooden bed frame to your room. Whether you bat for Chicago or Cleveland, contact Marlena here to get these looks.